Well my team rocked it at the tournament yesterday! Everyone placed 1st or second in their divisions! I was a bit worried about the weigh ins since I wasn’t able to weigh myself before we left – need to get a scale! But I weighed in at 132 (needed to be under 135, was 140) so it was all good! I was expecting a weight cut to be much worse than it actually was. I had one water bottle to sip on if I got too miserable, and a couple handfuls of frozen grapes to keep blood sugars even. Then after weigh ins, I munched on fruit, oatmeal, water, and a protein shake for the next several hours. Didn’t get jitters as badly this time! Barely had any actually – I was more pumped than anything! I got put in the novice category since I have had under 6 months of training. Jumped guard and pulled her down. Don’t know any front choke attacks in no gi, so I went after her arms which she was nicely bracing on the mat for me. Went a kimura, then ghost arm bar on her left arm, which she defended well. A few seconds of her trying to open my guard. Her right arm slipped to the mat and I locked in a kimura. She suddenly starts screaming “tap!” While I hear her elbow popping. I felt kind of bad for that elbow, she said she was tapping before I swung my leg over, but her other arm was under me and I didn’t feel it. But it’s a hazard of the game I guess – and she’ll be ok. Coach said it’s her fault for not tapping sooner or louder. They moved me out of the novice ranks for the gi competition – I guess breaking your opponents is grounds for moving up in the ranks! My coach approved my game plan which was: pull guard, get spider grips, go for a triangle. If triangle doesn’t work, go for sweep. Worked like a charm in my first match. Not sure about the time but it seemed like less than my no gi fight. Then I waited around for a battle for 1st place. Appears there were only 5 people in my weight class. 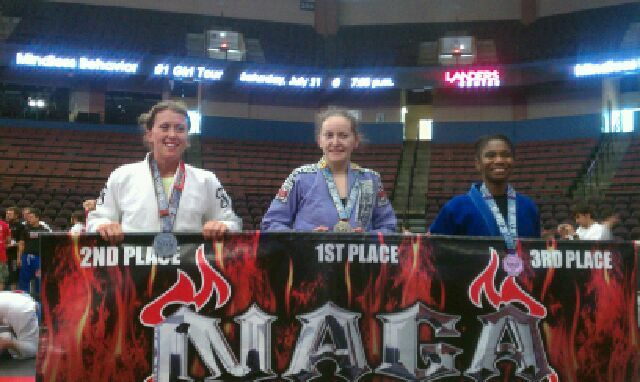 Man we need more Jiu Jitsu girls! Coach told me to use the same game plan in the next fight. She defended pretty well, but she was on the defense the whole time. Went to a ref’s decision and they gave it to me. Coach says I made it a lot harder than necessary. My focus for the next few weeks is still gonna be sweeps. I had a tripod and ankle pick a few times and just didn’t recognize them. All told, everyone on my team placed in their divisions – with a lot of 1st places being called out. Aaaaaaayyy! Coach was really proud of everyone! And I love my team! 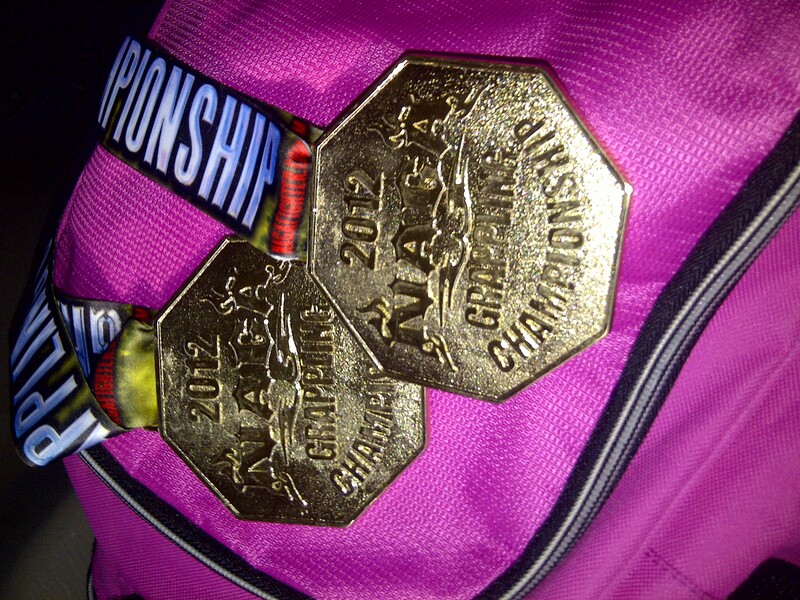 I ended up coming home with double gold medals! Such a good feeling! Next tournament is in 6 weeks. Doing the EGO in Nashville – and I’m gonna be a sweeping machine! I’m also gonna start doing the 3 classes in a row tue and thur night. Gi, no gi, then gi again. I figure that’ll help me get in better shape – and gonna start riding my bike to class. If I’m recovered enough, I’m gonna try the bike tomorrow morning.